The grubs that feed on the roots of cane plants can only be eradicated by pulling out the crop, leaving the field fallow and then replanting, adding to the stress of farmers already dealing with meagre harvests. Wadwal: India may have found a fix to its sugar problem but the answer will not make its cane farmers happy. After a bumper crop, sugar stockpiles in the country, the world’s second-largest producer of the sweetener, have more than doubled since last year. With another record crop expected in the current growing season, India is subsidising sugar exports, threatening to glut the market even as prices fell to the lowest in ten years on September 27. But, an infestation of white grubs in Maharashtra, India‘s second-biggest sugar producing state, and neighbouring Karnataka, the third-largest producer, could mean sugar output for the 2018-19 crop year will be 9% less than earlier estimates. 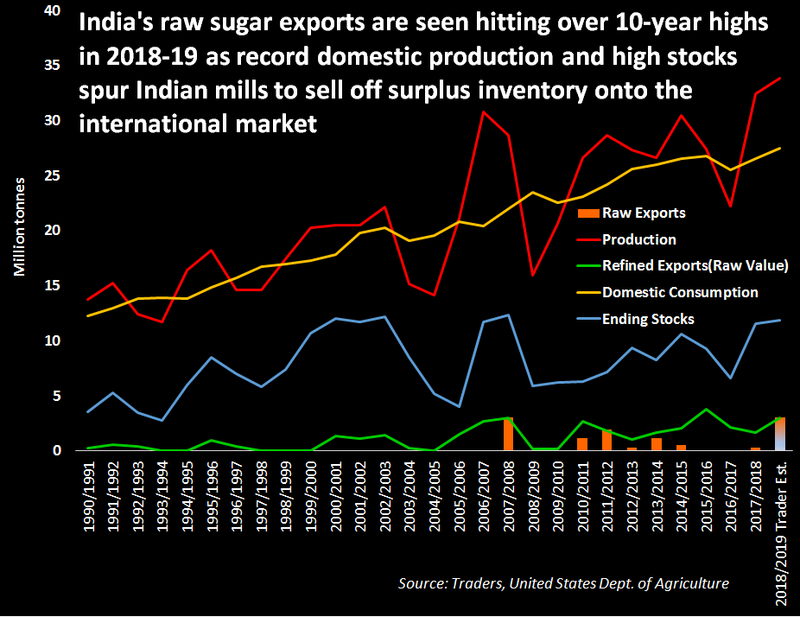 India‘s raw sugar exports are seen hitting over 10-year highs in 2018-19. While the lower output could reduce India‘s ten million tonnes of sugar inventories, the grubs that feed on the roots of cane plants can only be eradicated by pulling out the crop, leaving the field fallow and then replanting, adding to the stress of farmers already dealing with meagre harvests. “From August, cane stalks started wilting despite timely irrigation. 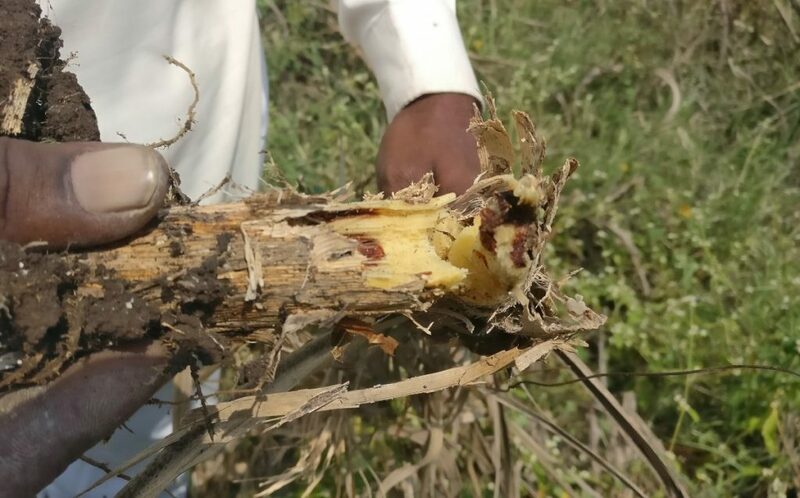 When we tried to find out the reason, we found white grubs were eating shoots,” farmer Sopan Salunkhe said, uprooting a cane to show mottled shoots pierced by white grubs, the larvae of a beetle species. Salunkhe may only harvest 20 tonnes of cane in the 2018-19 marketing season that started on October 1, down from 140 tonnes a year earlier. His entire 2.5-acre (1 hectare) farm in the village of Wadwal, about 400 km (249 miles) southeast of Mumbai has been affected. Throughout the interior of Maharashtra more than four dozen farmers told Reuters they are expecting lower yields this season because of the grubs that have thrived following lower-than-normal rainfall in August and September. Typically the heavy monsoon rains flood the fields drowning the grubs. The June to September monsoon provided 23% less rainfall than normal this year, according to state government data. India‘s biggest sugar producing state, Uttar Pradesh, also received slightly less rainfall than normal but the grubs have not infested crops there. The National Federation of Cooperative Sugar Factories Ltd (NFCSF), the trade association for cooperative sugar mills that operate 50% of the country’s processing capacity, has lowered its production forecast for the 2018-19 crop year to 32.4 million tonnes, including 9.7 million tonnes for Maharashtra. That is down from an earlier national forecast of up to 35.5 million tonnes and up to 11.5 million tonnes for Maharashtra. “We are revising output numbers downward due to severe pest attack,” Prakash Naiknavare, the NFCSF managing director said. Sporadic pest infestations have been reported in the past on a smaller scale, but the current outbreak is for the first time so widespread that it will impact overall sugar production, said B.B. Thombare, president of the Western India Sugar Mills Association. “There was belief among farmers that cane is a sturdy crop and can withstand pest and disease attacks. That perception has broken,” Thombare said. Farmers throughout Maharashtra are struggling to control it. “We tried to kill the grubs by spraying kerosene, salt and various pesticides but couldn’t as the worms reside nearly a foot below the ground,” said Ashok Giramkar, a farmer from Dalaj village in Pune district, nearly 300 km (186 miles) southeast of Mumbai, who was feeding wilted cane to cattle. In June to July, white grub worms remain small enough to be killed with pesticides, but they are now fully grown and can survive underground even after different pesticides have been applied, said R.G. 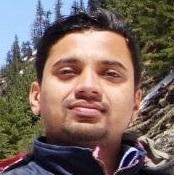 Yadav, an entomologist at Vasantdada Sugar Institute, a research body in Pune, Maharashtra. The grub has also been reported in neighbouring Karnataka, said an official with the state agriculture department that asked to remain unidentified. “Many farmers could not take ratoon crop due to the pest infestation. They have to uproot the crop after harvesting,” the official said. The ratoon crop is the root stub of cane after the first harvest that usually remains in the ground for a second harvest, but now must be removed to kill off the grubs. The grub infestation and lower rainfall have curtailed cane plantings for the 2019/20 season, said the NFCSF’s Naiknavare, adding that next year’s sugar production could fall to 29.2 million tonnes. To be sure, this year’s sugar output forecast of 32.4 million tonnes would set a record for a second straight year. But, the lower-than-estimated production could help cut the ample inventories in India and limit exports, said a Mumbai-based trader with a global trading company. India‘s mills signed deals earlier this month to export raw sugar for the first time in three years after securing government subsidies designed to cut the inventory buildup. “The market has priced in huge exports from India, but that amount will be lower than anticipated. With lower production, mills’ surplus for exports will also fall,” the trader said.